Christmas candles are a must-have – after all, the festive season really is the perfect time to indulge in delicious home fragrances. 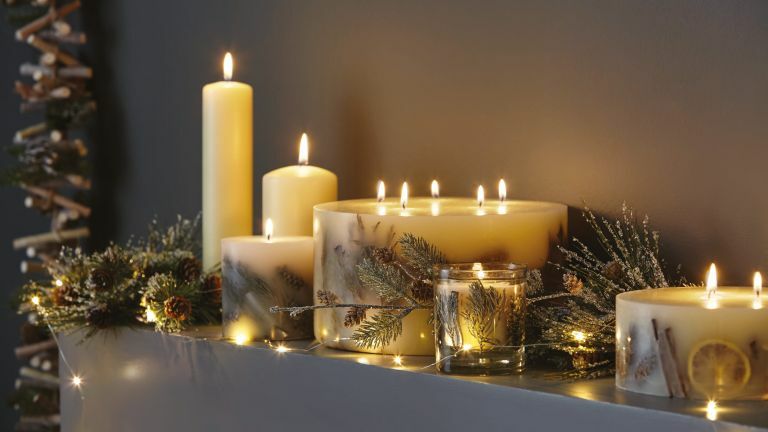 Whether you are craving a scent that reminds you of the festive seasons of your childhood, want to amplify and complement the natural fragrance of your Christmas tree, or simply impress guests with a beautifully-scented home, look no further than our guide to the best festive candles. Find more Christmas buys and ideas on our dedicated page. And why not browse through our Top 50 gifts, handpicked by the Real Homes team? What could be more Christmassy than the sweet-spicy tang of cinnamon? A firm festive favourite in many homes, it works well with most other sweet notes – hence the proliferation of cinnamon-apple candles. Our favourite is the very sweet and cheerful Vanilla & Cinnamon candle from Dobbies. Uncomplicated joy. Sugar and spice, and all things nice! Mulled wine is one of the biggest joys of the Christmas season – not least thanks to the wonderful smell of citrus and spices that fills the house while you're making it. Want the scent, but not the wine? The Mulled Spice candle from Laura Ashley is a realistic recreation of the fragrance. With its festive engraving it'll fit right into your Christmas decor, too. If sweet and spicy isn't your thing, but you still want your home to smell recognisably of Christmas, pick a fresh pine fragrance. Quality is key in order to avoid a toilet freshener effect; our pick of the bunch is the lovely Mistletoe & Fir number from Marks and Spencer. A glass of Amaretto after Christmas dinner...delicious. Boozy fragrance notes work remarkably well in colder weather, and are great for giving otherwise very sweet scents a grown-up twist. Yankee Candles are a festive favourite, and we especially like the sweet but sozzled Amaretto Apple and the moreish Holiday Pomegranate, both available at Candles Direct. Want a scented candle that stands out from the crowd? Cire Trudon are one of the most sophisticated candle brands around (and one of the oldest, with their craftsmanship going back to the 13th Century), and their festive offering this year doesn't disappoint. The Odeurs D'Egypte Scented Candle set comes in stunning jars and offers three scents with an Ancient Egyptian theme: the fruity/woody Gizeh with a heart of birch, the rose- and sandalwood-based Amon, and the frankincense/labdanum Philae. What an exotic treat! Ward off Christmas scent-fatigue by picking a subtle scent that will continue to please long after the holidays. Our pick of understated fragrance chic is the Etoile candle from Ormonde Jayne. Hand-poured into a luxurious glass jar, this is a low-key twist on the citrus/spice combination. With a base of smoky amber and tonka bean, and a cheerful, realistic mandarin top note, this complex fragrance will continue to give joy throughout winter. What the candle smells like is the most important thing, but how it's packaged is no less significant, especially if the candle you're buying is a gift. Dyptique have really outdone themselves this Christmas, with stunning ornate packaging encasing the delicious Amande and Baume d'Ambre scents, these candles are sure to become festive bestsellers. Joy for some, headache or allergy for others – heavily fragranced candles might be better replaced with a natural candle, scented only with essential oils for some of us. We love the scented candles from Neom – plenty of choice to find a favourite, and the packaging is very chic. What if you like everything – spices, the scent of pine, and citrus? An all-in-one Christmas fragrance is what you need. The most important thing is to pick a candle that has some structure to the fragrance, like The White Company's Winter candle; it's popular for a reason – it's fresh, spicy, and sweet, and instantly comforting. There's something infinitely exciting about the scent of fresh berries, which is sweet and sour at the same time, and very distinctive. It's also hellishly difficult to get right in perfumery, with less successful attempts at berry scents smelling a bit like bubblegum. The Winter Berries candle from Beefayre is just on the right side of sweet, with the tangy berry note cutting through the spicy base. Available at Annabel James. Christmas is a time for indoor festivities, and all the associated smells of spices and festive food and drink. But it's also a time for long wintry walks. The Woodland Walks Candle from Sophie Allport successfully marries the two aspects of festive fun, with notes of forest leaves, sloe gin, and firewood. Fresh and cosy at the same time. What could be more Christmassy than the smell of a clementine being peeled? And what's more festive than just-opened Prosecco? Guess what: there's a scented candle that combines the two. Clementine and Prosecco by Heyland & Whittle is pure, uncomplicated festive joy, and is very reasonably priced. Maybe you like changing up your home fragrance as the mood takes you, or perhaps you like having a different scent in each room in the house; whatever the reason, there's no need to settle on just one fragrance. Go for a mini candle set, like the lovely Mood Collection Gift Set from The Harrogate Candle Company. It includes a 10cl size of all five of their fragrances, which range from the warming Orange and Cinnamon to the zingy Lime and Black Pepper. And here's for something a bit different – and utterly gorgeous as far as festive home fragrances go. The Vetiver and Black Spruce candle from Espa is a genius take on a winter fragrance: there is warming spice there (the delicious cardamom note), but there is also something that is a gentle reminder of warm summer air (the vetiver, with its mysterious, green but smoky smell). The packaging is very elegant, too. We love it.